Plans for a two-day outdoor music festival in Hawick this summer have been shelved until 2017. 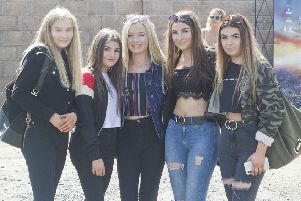 The event promoter, Bill Lothian, formerly of Hawick, cited difficulties in tying up headline acts for the Mansfield Park extravaganza but has pledged to reconsider the proposal for next year. Mr Lothian, of Falkirk-based Wigwam Concert Promotions, commented: “After careful consideration, we have decided to postpone plans for a major outdoor music festival, which would have been held with the assistance of Hawick Rugby Football Club, on August 20/21 this year. He said talks had place with local licensing and advisory bodies ahead of staging concerts on this scale. Mr Lothian added: “However, we’ve been scouring the music world for what we would consider major headline acts, and have not been able to secure the particular ones we wanted to ensure the healthy audience numbers required to make this possible.